That’s where YOU come in! As the strategic genius behind your own personal Private Military Corporation, you’ve offed to help by bringing in your team of skilled mercenaries to retake the tormented nation of Khanpaa! Help the oppressed people by hiring a team of hardened guns-for-hire and prepare for battle in treacherously frozen mountain badlands. Along the way, discover why Khanpaa has been turned into a bloody battlefield and who aims to truly profit. 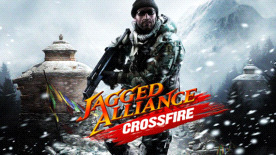 Jagged Alliance: Crossfire is a stand-alone expansion to the hit tactical RPG – Jagged Alliance: Back in Action. Crossfire adds new mercenaries, new environments and new weapons to challenge the player’s battlefield planning skills, while offering the combination of humorous dialog and realistic combat fans have come to expect from the series’ decade-long history.